What Happened to the Storque? From 2007 to 2011, Etsy.com, the online craft-selling marketplace, published a blog called the Storque. In its early days the Storque showcased new features available to sellers. However, as Etsy evolved, so did its blog. The blog went from showcasing technical features to highlighting vendors, to providing a platform for the company to showcase its culture and outline its philosophy. Visitors to the blog today find a simple “404 – Page Not Found” message, but the site tells the story of both the early Etsy and its transition to a more corporate ethos. Editor’s note: By the way, you may be wondering why you’re reading a story about Etsy on a site devoted to diamonds. But, diamonds are often at the heart of Etsy. In fact, a quick search shows that diamonds are central to more than 850,000 of the items currently for sale on the site. The fledgling company grew rapidly, and by 2007, it had attracted 450,000 sellers who were generating aggregate annual sales of $26 million. That year Etsy raised more than $3 million in venture capital. As the success of the company exploded, its founders struggled to keep their philosophy and management styles in sync. For example, in 2007, Etsy asked its members to take a “Buy Handmade” pledge. The pledge read: “I pledge to buy handmade this holiday season and request that others do the same for me”. The company launched BuyHandmade.org, which collected the pledges. By September 2011, nearly 53,000 people had signed on. Maguire and Schoppik left in August, 2008, complaining of Kalin’s lack of focus. Shortly after, Kalin hired Chad Dickerson, Senior Director of Product at Yahoo, to fill the leadership void. Dickerson was so successful, that he replaced Kalin as CEO three years into his tenure. 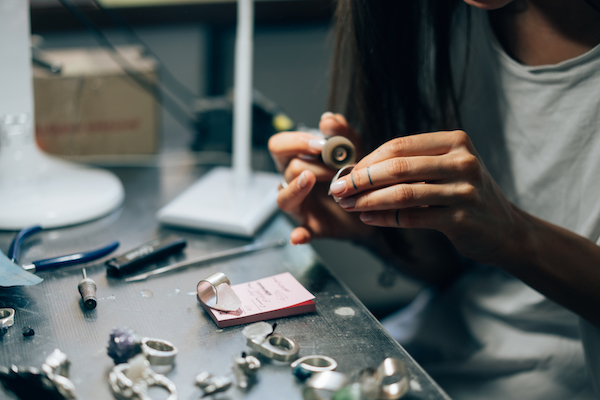 To increase the financial success of the company Dickerson changed Etsy’s Terms of Service to allow sellers to sell both handmade goods and manufactured goods. By February of 2012 the “Buy Handmade” pledge was dead, and BuyHandmade.org simply redirected to Etsy.com. Despite some backlash from members, Etsy continued to grow at an explosive rate. By 2014 women made up 51 percent of the company’s staff and one-third of its leadership and technology teams. The company claimed more than 1.3 million active sellers. By 2018, that number had grown to more than 2 million. In 2005, Etsy recorded USD $170,000 in sales. 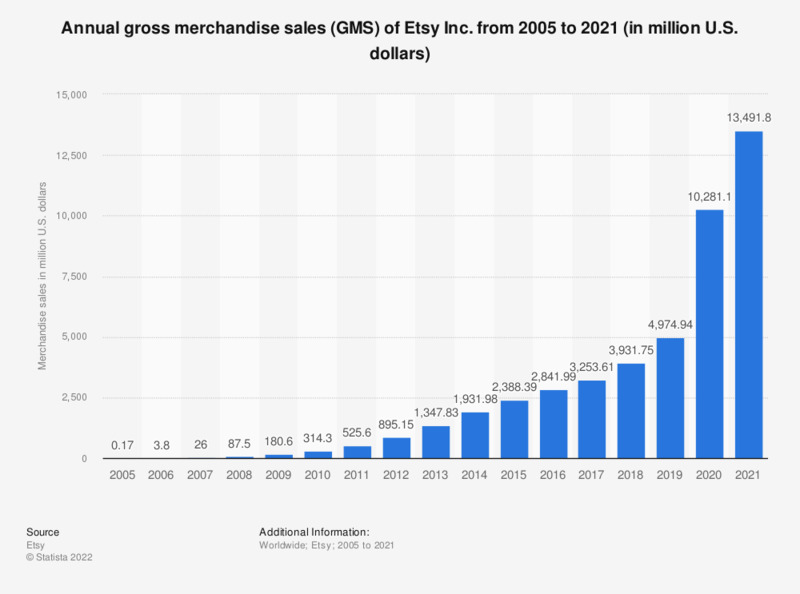 Thirteen short years later (in 2018) Etsy sold nearly USD $4 billion worth of goods. As Etsy’s success grew, its founders launched a blog named the Storque. From its initial post on Sep 2, 2007, it’s clear that the name is an alternate spelling of the bird called a “stork”. However, it’s also clear that the editors didn’t choose the name because of a hidden meaning or backstory. In November of 2007 they wrote: “We love the Storque and we love its name. It’s fun to say and pretty unique. However, since The Storque is new and has a funny name that doesn’t scream out its meaning, we want to make sure people understand what it is.” (It’s humorous that they don’t really explain what it means in that post. Instead, they ask their readers for help explaining it to other people). In its early days, the Storque highlighted tips and tools to help sellers boost sales. One such tip involved suggestions on how to use histograms (charts that map the distribution of light in images) to enhance photos of products. The blog also categorized articles under topics such as Spotlight, This Handmade Life, Craftivism, How-To, Reviews, Etsy News, Events, and ETC. Some of these categories continue to be relevant today. While searches for the term “craftivism,” (using the domestic arts as a form of activism) peaked in 2007, the term trended upward in 2017 and 2018. This category featured articles on knitting quilts for peace protests and the importance of buying goods from small, ethical businesses. Additionally, in an economy increasingly reliant on “gig” jobs, it’s interesting to look back at some of the success stories from entrepreneurs on Etsy. The Storque often included stories about people who found success on Etsy, quit their day jobs, and worked full time for their small business on the platform. Stories of people who worked for years in the public school system, as marketing specialists, or even as an egg packager were featured in this category. In conjunction with this article, “A Fond Farewell” represented another part of the company’s journey as Schoppik and Maguire bid adieu to the company. Grappling with the large influx of sellers and interest in Etsy’s products would require an overhaul of the company’s current operations. In 2009, Etsy’s the Storque was nominated for a blogger award called a Bloggie. The Storque faced four competitors in the “Best Art, Craft, or Design Blog” category, including PostSecret (the eventual winner), Yarn Harlot, Craftastrophe and Apartment Therapy.